This post is sponsored by STAR FINE FOODS, maker of awesome Olive Oils, Vinegars, olives, glazes, capers, anchovies, onions, and the list goes ON and ON! 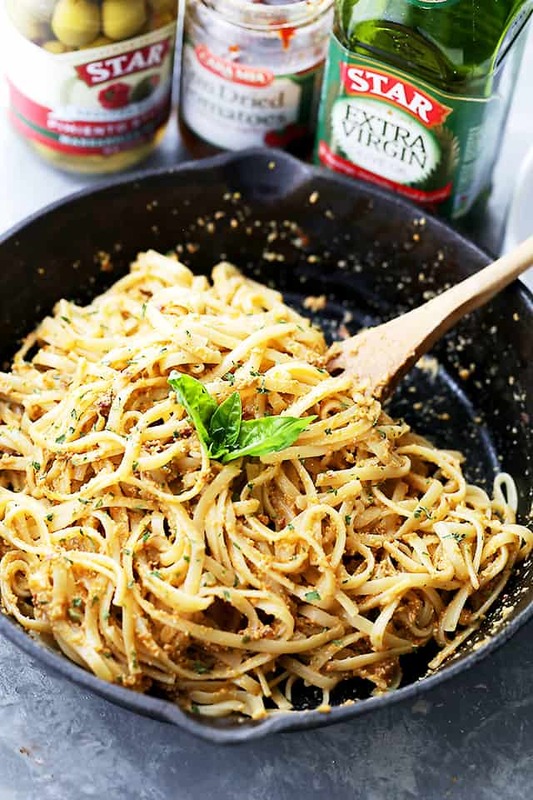 Olive Pesto Pasta Recipe – Quick and easy pasta dinner tossed in a homemade olive pesto made with pimiento-stuffed olives, fresh basil, and sun-dried tomatoes. Hello, guys!! It’s pasta-Sunday! We should make that a weekly thing because, I love themes! Kind of keeps me organized ‘n stuff. What keeps me unorganized (disorganized?!?) is gloomy, humid summer weather that just won’t let up. I can’t take a single, pretty looking photo. My apologies, please. From the inside of the house, the outside looks like Fall. You step out on the porch, oh my Moses!! IT IS hot, humid, and sticky. At that point I just scoot back inside, blast the A/C and start cooking. Starting with olives in a blender. Err. Food processor. In other news, when was the last time you made an olive pesto? If it’s longer than a month, THAT is far too long. To be honest, the first time I made this Olive Pesto Pasta was probably a bit over a year ago when I got a hold of these STAR Pimiento Stuffed Olives. Thing is, until a few years back, I didn’t even like olives. Some were too salty, others tasted a bit too bitter, or the pit would annoy me, and so on and so forth … things just never lined up. Not until I finally veered off course and started to give other olives a chance. Like, how can I pass up a jar of these beauties? 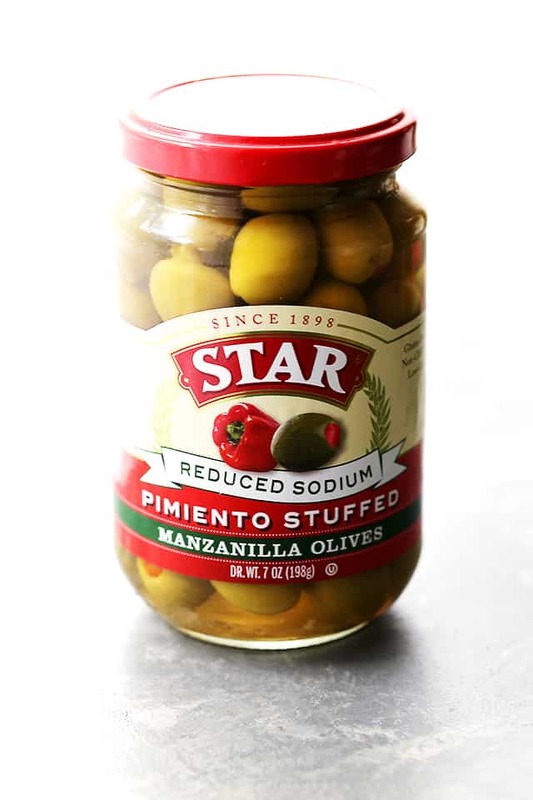 STAR’s Reduced Sodium Pimiento Stuffed Olives are extra delicious. Tender, smoky and sweet, just as olives should be. Then, once you add them to this pesto, you honestly can’t say NO to the creamy, salty, a bit spicy, a bit sweet mixture that is olive pesto. Made with olives, and basil, and sun-dried tomatoes, and garlic, and STAR Extra Virgin Olive Oil, and pine nuts!! Good Lawwwwd, I put everything in there. 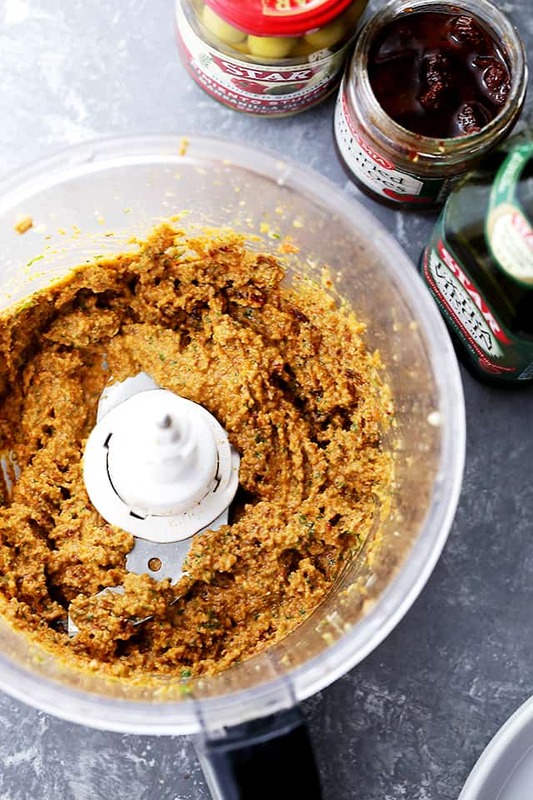 It’s like an olive tapenade meets basil pesto. GENIUS! The flavor, though; it is out of this world. And! I can’t stop making it! And, now I have my parents hooked on it, too, and THEY won’t stop making it. Stirring it into your bowl of fettuccine pasta? You will find yourself standing over the stove eating forkful by forkful because it’s THAT delicious. It’s a dish that will barely make it to your family’s plate because you will want it all to yourself. Best part, as always, this will come together in about 20 minutes. Make the pesto while the pasta is cooking, open up a bottle of chilled Chardonnay, and ENJOY! And while we’re on the subject of STAR, there’s a GIVEAWAY! All you have to do is share your #LoveLoveMoments. 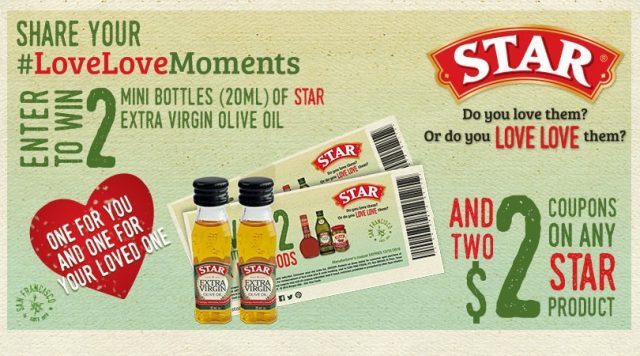 Share your #LoveLoveMoments with us and enter for your chance to instantly win one of 500 sets of two mini bottles (20mL) of STAR Extra Virgin Olive Oil and two $2 coupons good toward any STAR product. Plus, after registering, share this promotion and be entered to win $500. For each friend who uses your unique link to enter, you’ll receive an additional chance to win. 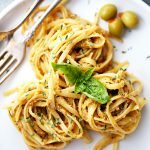 Olive Pesto Pasta Recipe - Quick and easy pasta dinner tossed in a homemade olive pesto made with pimiento-stuffed olives, fresh basil, and sun-dried tomatoes. Prepare pasta according to the directions on the package. 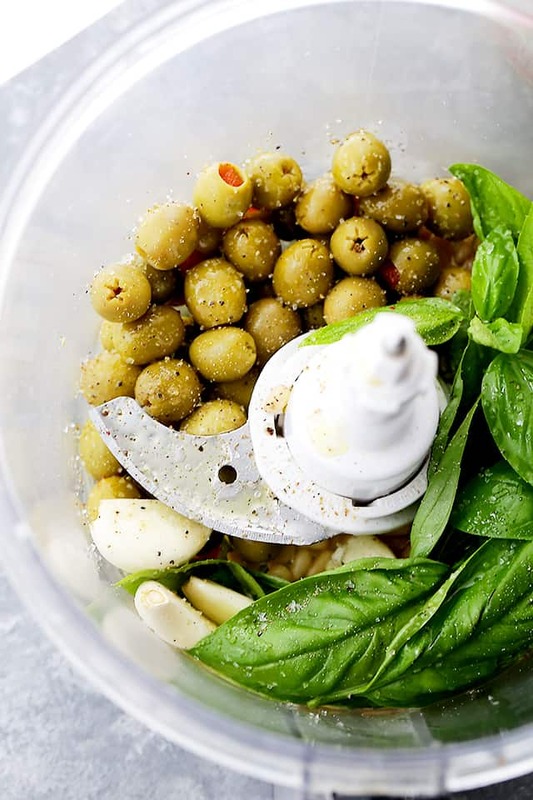 In a food processor, combine olives, basil, sun-dried tomatoes, garlic, pine nuts, and olive oil; pulse until smooth. Reserve a couple tablespoons of the pasta water and drain out the rest. Add the pesto (a few tablespoons at a time because you may not need all of it) and reserved pasta water to the prepared fettuccine; gently mix and stir until everything is well combined. STAR Pimiento Stuffed Olives are available at select Safeway, Vons, King Soopers, Ralphs, Smiths, Save Mart, Raley’s, Lucky, Food 4 Less, Smart & Final, Bashas, Walmart, Tom Thumb and Randalls stores and ONLINE. 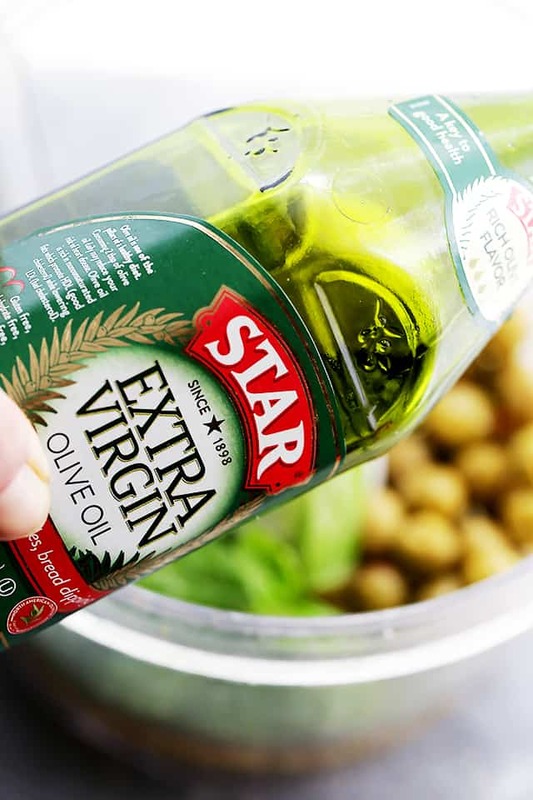 STAR EXTRA VIRGIN OLIVE OIL is available at retailers nationwide including Safeway, Kroger, Vons, Albertsons, Food 4 Less, Save Mart, Target, Walmart, Schnucks, Food Lion, Stater Bros., Raley’s, Smart & Final, Bashas, King Soopers, Vallarta, Jewel, Smith’s, Dierbergs, HEB and Ralphs stores and ONLINE. Wish I was digging into a big plate of this right now! Count me in for pasta Sundays! This pasta is everything. My boys would love this. I’ve never thought to put olives in pesto, so smart!! This pasta looks awesome! So many of my favorite flavors in this thoroughly delish looking dish! Confession: I’ve NEVER made pesto with olives… and I’ve clearly been missing out on pasta Sunday, too! Gotta fix both of these soon. This is genius!! We are huge olive fans, I bet this is wonderful! My daughter’s going to love this new pesto! What a great idea! The perfect pasta meal for me and those shots are awesome!!! You either love olives or you hate them, and my husband LOVES them (used to make him basically olive subs from a certain franchise.) He will love this! Well, YUM! I love olives and this sounds amazing! Olives, pesto and pasta…3 of my favorite things! 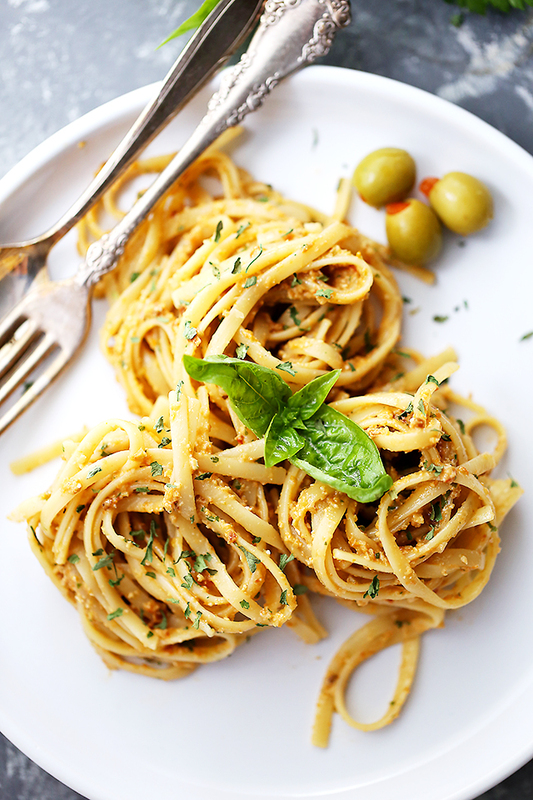 This simple pasta sounds SO flavorful and delish! Pinned!